The First Fall Nails – amandarobots. But once September rolls around, and especially after we get over those 25°C+ days, dark nails just feel right. My first foray of the season was with Essie’s Bordeaux. This is a shade that I’ve had for years and never fail to bring out whenever the colder months come around. Although I love dark nail colours, I sometimes find that dark blues and greens are not the most flattering on me. 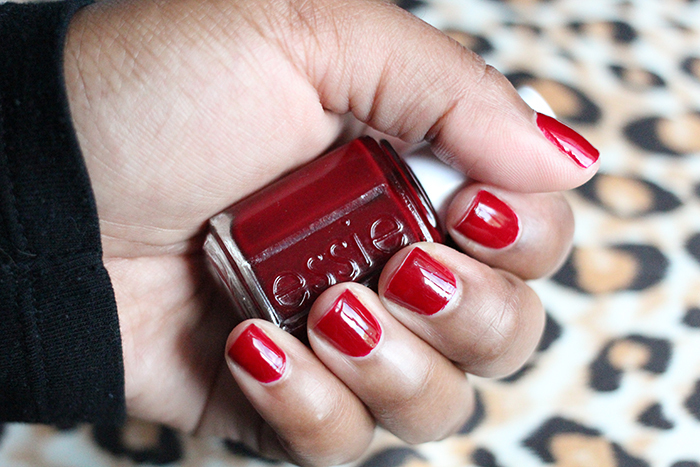 This bold burgundy hits all the right notes with the perfect balance of feminine, sweet, chic, and vampy. It looks especially sleek on short nails with an ultra-shiny top coat. I love the opacity and evenness I get from just two coats. One bit of advice I have for darker colours, and this one is particular, is to paint the free edge of the nail in between your coats. (First coat, paint free edge, then second coat.) This does two things: it helps the polish last longer without chipping, and covers up the light colour of the nail tips for a salon-manicured look.